Join us for the Parish’s International Festival on Saturday, May 12th! The festival celebrates the diversity of our parish with a rosary, a Mass and a Festival of Food. This sensational event is free of charge and attracts a big crowd. Come celebrate with us! Holy Trinity, along with St. Pius, St. John Fisher, St. Cecilia and St. Juan Diego, are welcome to Vacation Bible School! 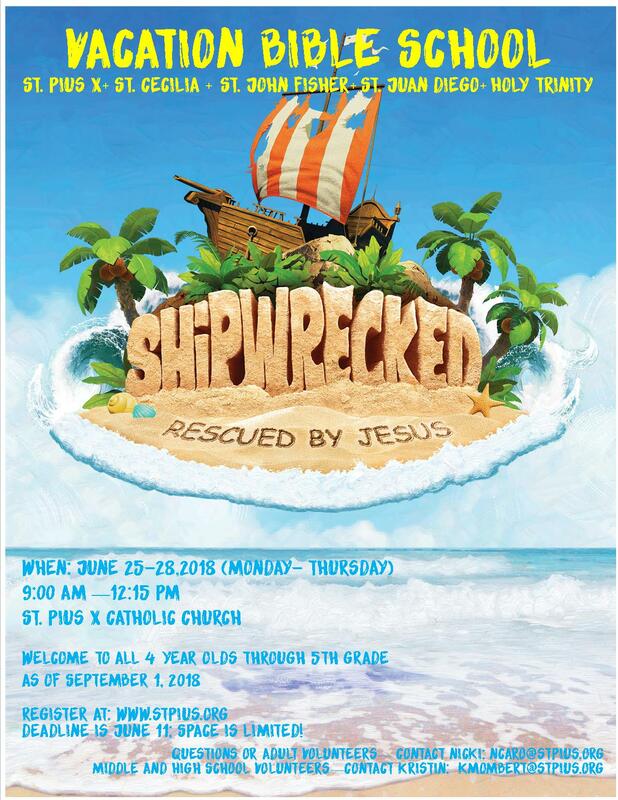 VBS will be held a St. Pius June 25-28th. Check out the flier and registration info here. The Holy Trinity Track and Field Club had another great day at the Track. Collectively the club had 82 PR’s on Saturday. Daniel Ryan, who bested his previous mark, with a long jump of 15’0.5” for the new Cub Boys HT Record and first place finish! The Cadet Girls long jump record was broken again with a jump of 16’10.25”! Hope Hansen torched the Girls Road Runner Shot Put record with a put of 19’ 9.75”! Chloe Chen continued her breakout season with a first-place finish in the Cub Girls 400 m dash. Grant Valley took 1st place in the Cub Boys 100 m dash and 1st place in the Cub Boys 400 m dash. Dominic Tran continued his breakout season with a first-place finish in the Cadet Boys 400 m dash. Henry Tierney continued his successful season with a first-place finish in the Cadet Boys 800 m run. Mikayla Contreras won the Cub Girls 1500 m run. Cooper Cardwell wrapped up his developmental meet Road Runner career with a win the 800 m run. Our Cub Boys 4 X 100 m relay and the Cadet Boys 4 X 400 m relay both took first place. Next Saturday, our Cubs and Cadets get a weekend to rest and get ready to compete at the big two-day Meet of Champions at Jesuit HS the following weekend… meanwhile, the Road Runners will be competing in the RR MOC at Valley Catholic. Come support our Road Runners to celebrate all the hard work they have put in on the track this season! All results can be viewed here.